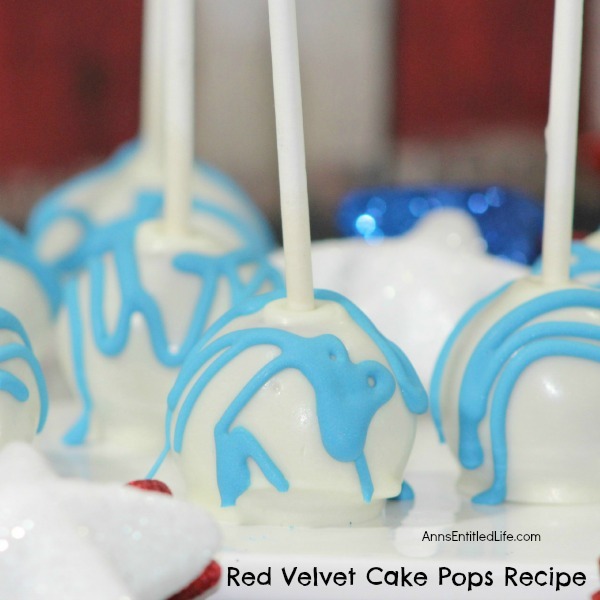 Turn moist and delicious red velvet cake into a fun cake pop! 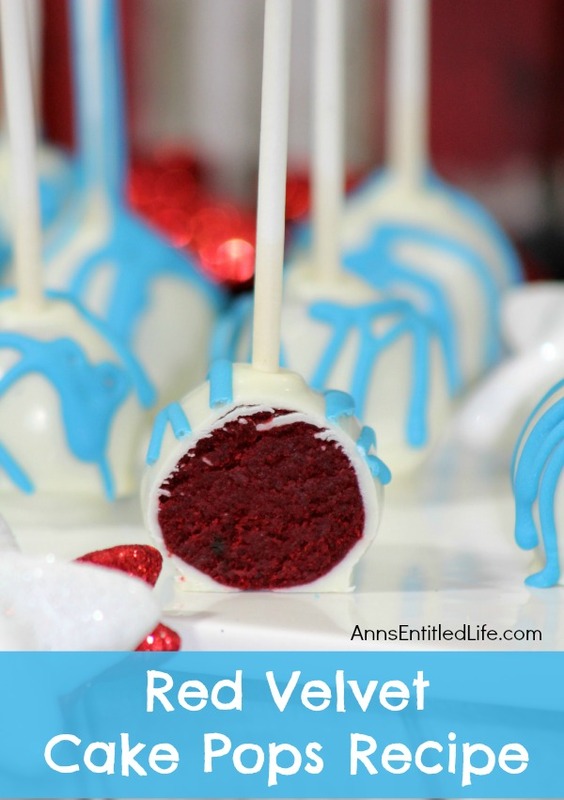 Perfect for parties, on the go, or as a great snack, these fabulous red velvet cake pops are a real crowd pleaser. • Spray a jelly roll pan (12½” x 17½” x1″) with non-stick cooking spray; set aside. • Sift together flour, cocoa powder, baking soda and salt in a bowl; set aside. • Using an electric mixer, beat together butter, shortening and sugar until light and fluffy. • Add the eggs, vanilla, red velvet extract and red gel food coloring; mixed well. • Alternate adding half the flour mixture and buttermilk to the batter until completely combined. • Spread the batter over the jelly roll pan, and bake for 20-22 minutes at 350° or until an inserted toothpick comes out clean. • Allow the cake to cool completely. • Spoon the cooled cake into a large bowl, add the chocolate frosting and mix well until you can form a ball with this mixture. You want your cake pops to be very moist and soft. • Roll 24 cake balls; set aside. • Using a double boiler, or a microwave melt the white melting wafers. • Dip the tip of the cake pop stick into the melted white chocolate then directly into one end of the cake ball. • Dip the entire cake ball into the melted white chocolate and coat the entire cake ball. Place the coated ball on the parchment lined cookie sheet, and allow to dry. • In a large bowl, combine the egg whites, cream of tartar, almond extract, confectioners sugar and blue gel food coloring with a wooden spoon until smooth. • Stripe the dry cake pops with royal icing using a #1 round piping tip to form lines. Do not overfill your piping bag. Allow the royal icing to fall naturally. • Allow to dry before serving. 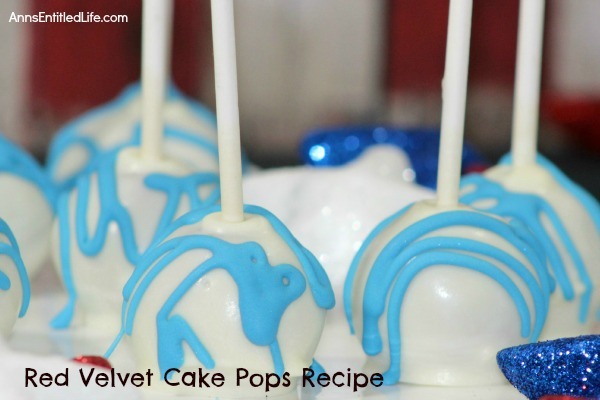 • To print the Red Velvet Cake Pops recipe, click here. • #1 Piping Tip Some people prefer a slightly thicker line, so use a 1.5 Piping Tip A more economical solution, if you plan on decorating cakes, cupcakes and cookies, is a Tips Kit. • And while I didn’t mention it in the post, if you are transporting the cake pops – for say a class birthday party for children, or a bake sale, wrap your cake pops.